Cut strips approximately 12cm (5 inches) wide. Brush lightly with butter and fold strip in half lengthwise. Brush top with butter, place filling on end of strip and fold into triangles as illustrated. 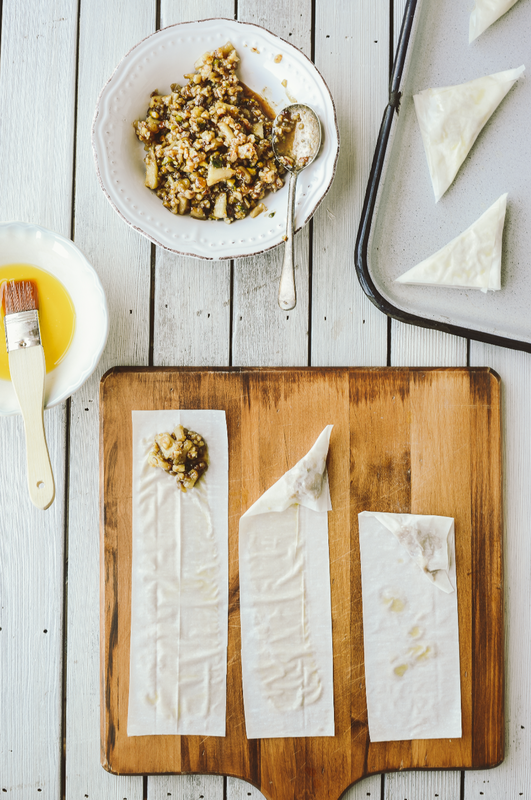 Place finished triangles on a lightly greased baking sheet and brush top lightly with butter. Cut strips approximately 6cm (2.5 inches) wide. Place filling on end of strip and fold up into a triangle. Brush end of strip lightly with water, complete fold and place fold side down on a cloth. Keep pastries covered with a dry cloth as they are prepared. As pastries for frying do not have the protection of butter, the pastry can dry out and flake. Cut strips approximately 25cm (10 inches) wide (or halve the sheet). Brush lightly with butter and fold strip in half lengthwise. Brush top with butter, place filling on end of strip 2cm (0.75 of an inch) in from base and sides. Fold base of pastry over filling and fold in sides. Roll up to end of strip (see illustration). Place join side down on a lightly greased baking sheet. Brush top lightly with butter. Cut strips approximately 12cm (5 inches) wide. Place filling as for baking rolls. When sides are folded over filling, press folds along length of strip and brush them lightly with water. Roll up and lightly brush final flap with water to seal roll. Place join side down on a cloth-covered tray and cover with a dry cloth. When preparing pastries for baking, instead of buttering the entire width of the strip, lightly butter only half the width, then fold over. There is no way you can save on the fat if frying pastries, so avoid this method if you are counting calories.